Originally Posted in American Blues Scene. In the 1800s, shank referred to the long shaft of the metal keys that were common at the time. When sharpened to a point, a key shank made a nasty weapon. 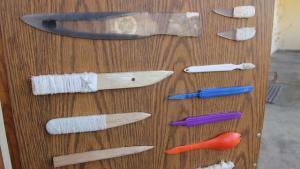 Linguists speculate that this may be the origin of the slang use of shank to refer to a handmade knife. 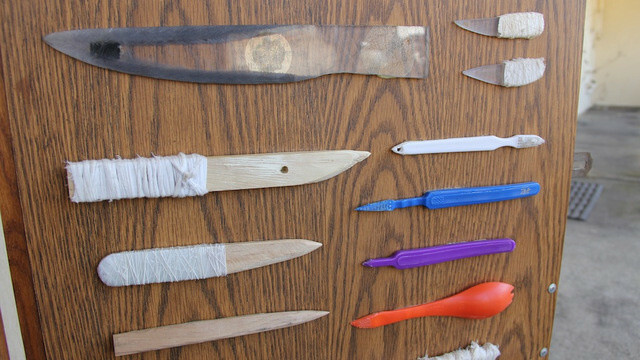 Prison inmates are notorious for crafting deadly shanks out of seemingly harmless objects. A shank can be made by melting the end of a toothbrush and inserting a razor blade into the plastic while it is still soft, for example, or by filing the handle of a spoon to a sharp point. A company called Securitas sells a line of No-Shank products for prisons, including the No-Shank Mirror and the No-Shank Toothbrush. According to musician Dr. John, “shankings,” or stabbings, were fairly common incidents in some of the rougher gutbucket joints a person might wander into for some blues and a drink, hence the nickname “bucket of blood,” for these types of establishments.